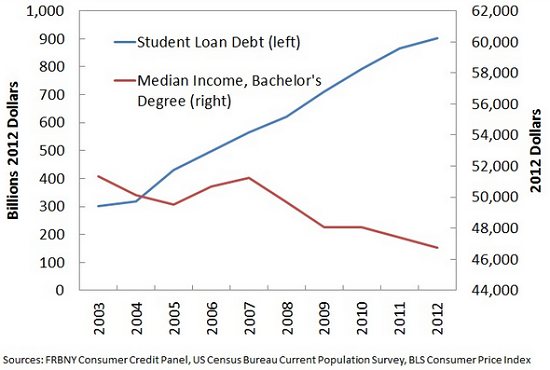 Student loan lenders are skimming tens of billions in profits guaranteed by the taxpayers. 1. The PR cover is "you all need a college diploma, and we're here to make that happen." Yea for more education! 2. 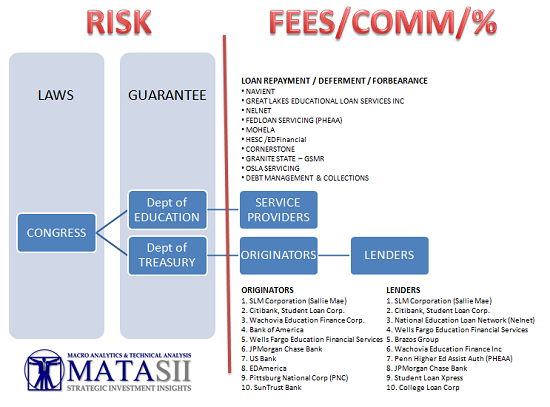 The extraction mechanism is student loans. 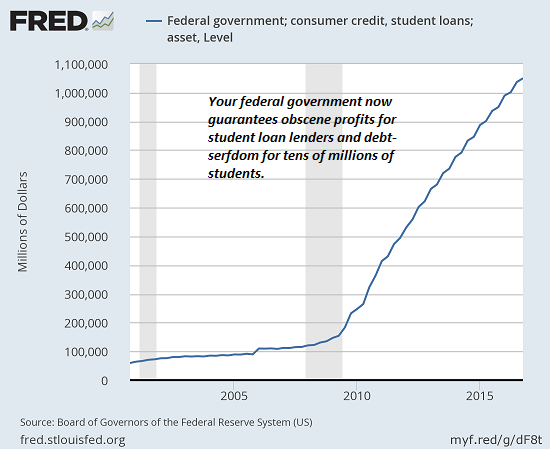 Here's a chart that shows what happened relatively recently: your federal government began guaranteeing obscene profits to student-loan lenders and debt-serfdom for tens of millions of "marks" i.e. students. Gordon Long has done some outstanding work clarifying the purposefully obscure swamp of obscene profits reaped from student debt-serfs. Gordon and I explain how the racket works in How College Has Become A Racket! (45 min. video program). The racket's foul core is the cartel structure of higher education: if you want a college diploma, you must satisfy a cartel member--an accredited institution. The problem, as I elaborate in my book The Nearly Free University and the Emerging Economy: The Revolution in Higher Education, accrediting the school gives no indication to employers if the student learned anything remotely useful, or indeed, anything at all. While the majority of students learn little or nothing of value, the legions of overpaid administrators have expanded like rats on a verdant island (i.e. an island with unlimited money via student loans). "There’s just a mind-boggling amount of money per student that’s being spent on administration," said Andrew Gillen, a senior researcher at the institutes. "It raises a question of priorities." Paying a bloated, overpaid-admin-heavy institution for the privilege of sitting through four years of lectures, online courses and a few labs no longer makes sense for the vast majority of students. What makes sense is dispensing with the entire bureaucracy of the cartel and costly campuses altogether, and designing directed apprenticeships which combine the best of online coursework with on-the-job training in workplaces. The vast majority of student are better served by mastering the 8 essential skills required in the emerging economy--skills that students can acquire on their own, a process of accrediting yourself that I address in detail in Get a Job, Build a Real Career and Defy a Bewildering Economy. Forgiving skyrocketing student debt won't solve the real problem which is the soaring costs imposed by a cartel that is failing to prepare students for the economy of tomorrow. As I explain in my books, the only real solution is accredit the student, not the school. While the higher-ed status quo is failing the students, it's enriching itself immensely. Assistant deans of student loans and thousands of other administrators who we managed to do without a generation ago are raking in huge salaries and fat benefits/pensions. Meanwhile, over in the financial racket that's enabled functionaries to skim $200,000 a year for doing essentially nothing remotely related to students actually learning anything remotely applicable in the real-world economy, student loan lenders are skimming tens of billions in profits guaranteed by the taxpayers. Yes, tens of billions: $140 billion in pure guaranteed profit has been skimmed off the hapless student debt-serfs herded into the shearing machine known as higher education. There is something Kafka-esque and Orwellian about calling this vast machine for reaping taxpayer-guaranteed obscene profits "higher education." Jobs data cannot prove that college is a "good investment"
Thank you, Brendan C. ($10/month), for your outrageously generous pledge to this site -- I am greatly honored by your steadfast support and readership. Thank you, Jayesh T. ($50), for your outstandingly generous contribution to this site -- I am greatly honored by your support and readership.